How to Easily Master Format SAMSUNG GALAXY CORE GT-I8260 / GT-I8262 DUAL with Safety Hard Reset? Tips and solutions for SAMSUNG GALAXY CORE GT-I8260 / GT-I8262 DUAL problem. There are 2 kind of Samsung Galaxy Core, first type is using single card GSM, and the other type using dual card GSM-GSM. Both type of Samsung Galaxy Core have same specifications at 4.3 inches LCD screen and have processor Dual-Core 1.2Ghz from Qualcomm. SAMSUNG GALAXY CORE GT-I8260 / GT-I8262 DUAL have dual camera as 5 megapixel at back and from have VGA camera which good for video conference. How to Fix and Problem Solving for Recovery SAMSUNG GALAXY CORE GT-I8260 / GT-I8262 DUAL hang or not responding or malfunctions or stuck or freezing or bricked ? Using dual-core 1.2Ghz processor with 1GB RAM at SAMSUNG GALAXY CORE GT-I8260 / GT-I8262 DUAL will make this phone can work easily for almost any applications from Google Play Store. But please remember, we do not suggest user to always download any applications from Google Play Store without read well the review from user, because some applications maybe can make problem with SAMSUNG GALAXY CORE GT-I8260 / GT-I8262 DUAL like hang or stuck or bricks or lcd touch screen not responsive or frozen or blank. If at the first time you get this problem, please try to do soft reset or reboot or restart SAMSUNG GALAXY CORE GT-I8260 / GT-I8262 DUAL to remove any temporary files or file cache from the memory. If the problem still happen then you need to do hard reset or master format. How to Soft Reset or Reboot or Restart SAMSUNG GALAXY CORE GT-I8260 / GT-I8262 DUAL ? There are several ways to do soft reset or restart, the easy way to soft reset or reboot or restart SAMSUNG GALAXY CORE GT-I8260 / GT-I8262 DUAL by remove the battery and then put again to the place then turn on the SAMSUNG GALAXY CORE GT-I8260 / GT-I8262 DUAL. If you do not want to open the battery, you can do easily with pressing Power Button for several seconds and the option menu to turn off or reboot will appear. SAMSUNG GALAXY CORE GT-I8260 / GT-I8262 DUAL will do the process to Master Reset to Factory Default, wait for several minutes. The SAMSUNG GALAXY CORE GT-I8260 / GT-I8262 DUAL will doing the process of restoring to factory default. How to Restore and Reinstall Clean Android Operating system / firmware at SAMSUNG GALAXY CORE GT-I8260 / GT-I8262 DUAL ? Do not worry to do reinstall or restore the clean and default setting Android operating system or firmware at SAMSUNG GALAXY CORE GT-I8260 / GT-I8262 DUAL because the file source already saved inside the SAMSUNG GALAXY CORE GT-I8260 / GT-I8262 DUAL ROM. If we think the phone really need to be reinstall or restore the default Android operating system or firmware, then we can do it easily by doing hard reset or master format step above, because the operating system will be reinstall by itself. How to Unlock or Fix or Bypass or Solutions for SAMSUNG GALAXY CORE GT-I8260 / GT-I8262 DUAL forgot password code or security lock screen pattern or pin? We are really suggest everyone who have important data at SAMSUNG GALAXY CORE GT-I8260 / GT-I8262 DUAL need to give security protection. The recommended one are using screen lock pattern or maybe some people still find that give password pin is more convenience. The problem happen when we forget the answer of screen lock pattern or password pin protection code. Do not worry, because we can bypass or unlock it using Android help with Forget Password / Pattern button. When we can not find it, try to do several time wrong answer continuously, then SAMSUNG GALAXY CORE GT-I8260 / GT-I8262 DUAL will be locked and the Forget Password / Pattern button will be appear. Press that button that we need to answer the Google account username and password (Gmail account). If we can not access Google account then the only way to unlock is doing hard reset or master format. How to Improve Performance SAMSUNG GALAXY CORE GT-I8260 / GT-I8262 DUAL to make run more faster? With the SAMSUNG GALAXY CORE GT-I8260 / GT-I8262 DUAL processor and big ram, the normal speed is quite fast, but some user maybe have experience SAMSUNG GALAXY CORE GT-I8260 / GT-I8262 DUAL reduce the speed or become slowly. This problem usually happen because there are too many background process applications which run together. Some applications need more resource when they do the job like updating the internet or something like that. Please try to uninstall some not use applications. If we need to make the SAMSUNG GALAXY CORE GT-I8260 / GT-I8262 DUAL performance back to faster again, please try to do hard reset to make it back like new again with default setting and default installed applications. Is That Any Secret Code for Doing Format SAMSUNG GALAXY CORE GT-I8260 / GT-I8262 DUAL ? 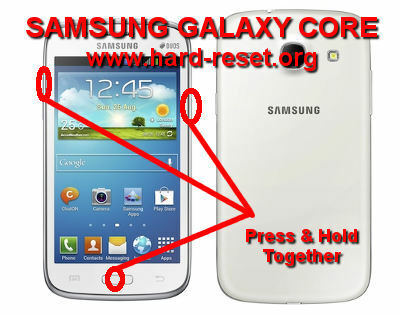 The secret code for doing hard reset SAMSUNG GALAXY CORE GT-I8260 / GT-I8262 DUAL is *2767*3855#. But please remember to always becareful typing that code, because the SAMSUNG GALAXY CORE GT-I8260 / GT-I8262 DUAL will doing hard reset and remove all data and installed applications. How to make Longer Life for SAMSUNG GALAXY CORE GT-I8260 / GT-I8262 DUAL Battery ? SAMSUNG GALAXY CORE GT-I8260 / GT-I8262 DUAL have 1800 mAh battery capacity. In some test, we can use this smartphone more than 8 – 12 hours in normal use with 3G data connection active or always on. If we need to extended battery life for SAMSUNG GALAXY CORE GT-I8260 / GT-I8262 DUAL, we can do several option. First do not make the LCD screen brightness to light. For some reason we suggest to use non automatic brightness. Try to use the low brightness light. Second option is using only 2G data connection will save a lot of energy of the SAMSUNG GALAXY CORE GT-I8260 / GT-I8262 DUAL battery, but or course this option will make our Internet or browsing speed become reduced. The other option that you need to do is turn off all not use connection such as GPS or Wifi. If the are many background process applications also will eat too much battery capacity, so better to reduce the installed applications. That options are important to improve SAMSUNG GALAXY CORE GT-I8260 / GT-I8262 DUAL battery live performance. How to Update or Upgrade SAMSUNG GALAXY CORE GT-I8260 / GT-I8262 DUAL to Android Kitkat or Android L ? Unfortunately until we make this information, Samsung still does not release official Android Kitkat update. If we see many Kitkat Update information at other community, mostly they are custom ROM or 3th party ROM. Please be careful when flash custom ROM to our SAMSUNG GALAXY CORE GT-I8260 / GT-I8262 DUAL because some wrong steps can make our phone become trouble. Read carefully the bug release when choosing custom ROM, because usually not all functions will run smoothly. About Android L, then maybe Samsung will not release Android L update for SAMSUNG GALAXY CORE GT-I8260 / GT-I8262 DUAL. [A] Hi, it seems that your wifi hardware got troubles and need to do further check at Samsung authorized service center. Because you have done hard reset but it still can not work. Therefore you can not access any wifi network from your Samsung Galaxy Core. [Q] Dear community, I've tried to hard reset my phone using option#2 but a warning appear saying that "custom Os cause a critical problems in phone and installed application" the system required me to download a custom OS and I did. But nothing happens. What should I do? [A] Hi, perhaps your Samsung Galaxy Core Dual has been installed using custom ROM, therefore the standard procedure can not fix your problems. Please consult with Samsung authorized service center. The information from this page describe about How to format samsung galaxy core,samsung i8262 hard reset,how to reset samsung galaxy core,how to hard reset samsung galaxy core,samsung core hard reset,how to format samsung core,how to reboot samsung galaxy core,samsung galaxy core hard reset,i8262 hard reset,samsung gt i8262 hard reset. If you need another resource for hard reset, use search function at this homepage or find from our related posts. Hi, if you forgot the security screen lock pattern answer, then you need to find Forget Pattern button after doing several time wrong pattern answer until Samsung Galaxy Core freeze for several seconds. Press that button then we will bring to answer Google account or Gmail username and password to unlock or bypass forgot screen lock pattern answer. If you can not access Google account, then you need to do hard reset with hardware button step above. I tried what you said but it did not work. No forgot password button appeared. What do I do? Hi, if your security password protections comes from the default Android os, then the Forget Password button should be appear after doing several time wrong answer at security field. Unless you install 3th party security applications from Google Play Store, then the process will be different depend on that applications. Please make sure about the that security type first. Hi, the first time you give security protection at your Samsung Galaxy Core, the phone will also ask you to type new pin for Backup PIN. This is to unlock your phone when you forget the main security protection. If you also forget the backup pin, then you should do recovery or unlock or bypass forgotten security protection using Gmail username and password. Please try to do several time wrong answer for security protection until the Samsung Galaxy Core locked and the Forgot Password / Pattern button appear. Press that button to unlock using Gmail account. The last option if you can not access Gmail account, then you have to do hard reset using #Option 2 above. Hello , i have a galaxy core for over a year . i was never using screen password. few day ago , while i had my phone in my pocket , screen password was required to access it. I really don’t know how this happened . Any way. i tried the instruction from here. i have already put wrong passwords about 80 times. but no fprgeotten password appears..Any help? thanks! Hi, usually the Forgot Password button will appear after you give wrong password at your phone several time continuously until the phone freeze for about 30 seconds. However, if you can not recovery your Samsung Galaxy Core using Google account steps, then you should do hard reset with hardware button to bypass the security protections, but sadly all your data will be removed and wipe after finish doing hard reset. Please consider to unplug the external card before doing hard reset as well. Hi, my galaxy core duos i8262 can not access gmailaccount . That i can not use google play store . Please help me. Thank You. Hi, try to login your Gmail account from web browser (eg. with Firefox or Chrome or IE) and open http://mail.google.com. If you can not access that Gmail account from Internet browser then you need to recover your password by follow the step which already provided at Google mail website. If you already finish to recover your Gmail account with web browser, then you can try again to login with your Samsung Galaxy Core. my phone frequently gets hanged up and says that “google play store has stopped”..help me out plz. Hi, some reason could be cause by several things. First, this problem usually happen because some applications not installed or run properly, then it make the Google Play Store stop to work. Other probability is because the Google Play Store itself have problem with update or any other internal causes. Please try to empty or clear cache of Google Play Store at your Samsung Galaxy Core by go to Setting > Applications > All and find Play Store applications. Find Clear Cache button and press that button to empty the Play Store cache. After that try to soft reset or restart your Samsung Galaxy Core. If the problem still happen, you should try to search the suspected applications which interference Google Play Store applications. If you still not solve the problem, the you may consider to do hard reset or master format, but please backup you important data because everything will be wipe and deleted when doing hard reset or master format. Hi, if you forget the security lock screen answer for Samsung Galaxy Core, then you need try to recovery with finding Forget Password / Pattern button. This button will be appear if you do several time wrong answer continuously. After pressing that button, you need to answer Google account / Gmail username and password at that smartphone to unlock the forgotten security lock protections. If you can not do this, then you need to do hard reset to make it work from beginning again. Hi, there are several options that you can follow to do master reset. If the phone still work normally, we suggest to use software menu option step. If your phone is stuck or can not start the Android os, then try to do hard reset use hardware button key carefully. Hi, if you already bring to service center, we assume that the hardware is fine now. Please try to do hard reset, and then we suggest you not to activate your Google account, you can try to create temporary Google account at your Samsung Galaxy Core. Try to use this phone for several day. Why we need to do this? Because Android have facility to backup and restore installed application by Google account at Google cloud server, sometime the applications and setting can be automatically backup to Google cloud server, and when you do hard reset or format all data will wipe from your Galaxy Core, but after login again with the same Google account, your Samsung Galaxy Core might restore that trouble applications back from Google cloud server. So, you can try to use other account and try for several days to see weather still have the same problem or not. Hi, officially the Galaxy Core GT-I8260 still not get official Android Kit-kat update from Samsung, but maybe you can get reference from other community website which already make custom rom (unofficial). But please remember, we need to follow carefully the step by step process to make custom rom can work properly at our smartphone. Anyway, we are not suggest doing update to custom rom because some wrong step can make our Samsung Galaxy Core become stuck or can not use anymore. Hi, this problem happen usually because you have ever try root or change unofficial firmware or install some applications that need to have root access. But some users also have this problem without doing root or something like that. First you can try to remove the external memory card, and plug it at memory card reader, connect it to computer to see weather some images already saved at memory card or not. If our phone already stuck or stop at Samsung logo welcome screen, then we can not access any data at internal memory, unless if you already install recovery applications like ClockModWork (CMW). In normal situations, if you never root your phone, then you should try to do hard reset without have possibility to backup all important data. Hopefully your phone will not remove some important data after doing hard reset, because some Android have two partitions inside internal memory, which are system and internal data (act as SDcard) partitions, but we are not sure this state also available at your phone. Hi, my galaxy core duos GT-18262 , how to format my mobile with safety,all applications running slowley include keypad(when i call to others keypad running slowley)Please help me. Thank You. Hi, you can try to follow several option steps above, but if you still can use setting menu, do it with option 1 are recommended. But you need to backup all important data to other safe location outside the phone, because all data will be wipe from your Samsung Galaxy Core smartphone. Hi.My galaxy core duos menu button is not working. What can I do? Hi, maybe Galaxy Core Menu can not work because some installed applications did something wrong. Please try to removed the last installed applications that make your Samsung Galaxy Menu does not work. If you can not find the applications, than you may have to do hard reset, but please backup all data first before doing hard reset. Some time my Galaxy core i8262 cam shows ‘error’. how can I resolve it? Hi, there are many causes that show error, but maybe you should try to find the applications problem. Please uninstall suspected applications, if you can not find that apps and the problem still happen, then you can try to hard reset after doing backup all important data, because the hard reset will remove all your data from this phone. Hi, my galaxy core duos GT-18262 having error with massaging. Always appear ‘unfortunately, massaging has stop’. Please help me. Thank you. Hi, this message usually appear because the Samsung Galaxy Core Duos can not run the specific applications. You can try to find out that applications and uninstall it, but if you can not find that apps, then you have to do hard reset or master format, but please backup all important data before performing hard reset. hi, my galaxy core duos..is charging very slow..and sometimes does even charge..what do i do? it charges from other charger..but from its own charger. its taking a very long time..
Hi, if your Samsung Galaxy Core only can charge from other charger, then maybe the your own Samsung charger have problem or damage. If you charge with 3th party charger, make sure you use minimum 1000mA / 1A charger, because if you charger with non Samsung charger or 3th party charger, some of them only have 500mA or bellow 1A, so it will make the charging time become slow the usual. Hi, you can move several data like downloaded movie or files or pictures from internal memory to external microSD card using file manager. You can download file manager applications like EsFile-Manager from Google Play Store. Please note for applications, not all applications can be moved to external card, this is depend on the programmer. But you could try to download a tools from Google Play Store known as Apps2SD or AppMgr, this applications will help to find which applications can be moved to external card. Hi, you can use 3th party applications download from Google Play Store to block certain numbers who make phone call to your phone. Please find the high ranking one, read as many reviews as possible to get the best applications for block phone call. Hi, try to download other 3th party camera applications from Google Play Store. If the camera problem still happen, then try to do hard reset or master format for reset all setting and applications to factory default. Hi, after installing CF3D drivers on my Galaxy Core, the phone freezes on Galaxy Core Logo. Hi, the requirement to install Chainfire3D that your phone should rooted before. As you know, rooting are not recommended to do because some wrong installation or setting can make our phone stuck and can not work normally again. The problem with your Samsung Galaxy Core happen because some setting and the Chainfire3D installation is not working properly, therefor this situation make your phone stuck in boot logo and can not work anymore. So, you could consult with Samsung service center, but some of them can not help this problem also. Hi, you can try to install some 3th party camera applications from Google Play Store to make sure your trouble come from hardware or software. The final step to reset all setting at your Samsung Galaxy Core including camera setting, then you could consider to do hard reset or master format, but please do backup for all important data, pictures, movie and anything from your phone, because all of them could erase or wipe from your phone. Hi, there are several options to master format. If you cousin often doing master format using software menu, then you should give security protection such as screen lock pattern or password pin protection. But if your cousin also doing master format using hardware button key, then nothing we can do to protect our data. Just do backup as much as possible, however the applications and some other new data which has not synchronize or backup will be remove. Hi, the transfer data from Samsung Galaxy Core to PC should work as easy as copy and paste between drive or folder. Usually if you see some applications appear at your PC after connected the phone using USB cable, this is because your PC detect the phone memory have some files which need to open using specific applications at you PC. Try to ignore that camera icon at you PC, after that open your PC file manager for File Explorer, at File Explorer fine your Samsung Galaxy Core drive, it usually mount as external drive. Please make sure after connected using USB cable, your Samsung Galaxy Core screen already told that you are connected to transfer file or as mass storage. How can I disable safe mode on my galaxy gt-18262..i tried different method but no avail..like restarting the phone..i even hard reset it but it keep showing safe mode. Hi, basically safe mode will be appear or activate when we boot Samsung Galaxy Core together with press Menu button or the left of Home button (home button is in the middle). Usually the normal operating system will easily turn off or stop the safe mode after we do soft reset or reboot the phone. Try to do it again several time without touch anything at the menu soft key. The other option you can try is consider doing hard reset to reinstall the factory default operating system to your Samsung Galaxy Core, but of course you need to backup all important data before doing hard reset, because all important data will be wipe or remove while performing hard reset. I have by mistake deleted the samsung app store application from my Core I 8262. How can i restore it agin? Hi, uninstall the application will make all data and setting for that apps will be remove as well. So, you can try to download again from Google Play Store to have that application again. Some applications maybe backup or have export to other folder for data, so we can import or restore again for later time, but if you never do backup or export from that applications, then you should setup again that new installed application from beginning. I have samsung GT-18260 and am very very annoyed with very poor or No connection. I am very dissappointed for skype, viber, whatisup… the connection is extremely very poor. What can I do? Please help me or tell me if it is the capacity of the apparatus. Hi, the connection really depend on your network provider. Some provider does not have good connection at specific area, but it will work fine at other place. Therefore you should try to test your network connection to several different locations, if some place fine then you should consider to change provider with better network coverage area in your city. Other possibility is that you activate 2G only data network at your Samsung Galaxy Core, please make sure you use 3G network from Menu Setting > More > Mobile Networks > Preferred network type choose to 3G or WCDMA preferred. Hi, if you have forgotten Samsung Galaxy Core screen lock pattern and you could not access Google account, then you should do hard reset with hardware button key at #Option 2 above. After finish hard reset, you should setup phone again from beginning like sign-in to Google account and download some important apps for your activity. I have core 8262 . I have trying hard reset phone by key. Like option 1 and options 2.
but this not working. Phone restart only. So how can I do hatd reset my phone? Hi, in normal firmware or operating system, we can do hard reset without any problem with #option 1 or 2 above. But if your Samsung Galaxy Core get other problem or flash with non official ROM, then maybe some standard procedure will not work normally. Please help me sort this problem out ! I recently got a samsung core gt-i8262 from Dubai . i am in Nepal . Hi, we are not sure about your problem, but usually if you are already have Google Play Store, you should possible to download some applications from that Google Play Store. As far as we know, there are some applications that only can download for specific country depend on Network Provider which tell our country, but this case only happen for several applications, not all. Have you already try to hard reset, and resetting with new Google account. Sign-up new Gmail account and try download from Google Play Store again. many times I try to wrong pattern so Samsung core 18260 is locked.they want to pin code.now what can I do?please help me. Hi, when the first time you give pattern to your Samsung Galaxy Core, it will also ask you too give phone Backup PIN for help you bypass or unlock you phone when you forgot the pattern secruity answer. But if you also forgot about PIN Backup at your Samsung Galaxy Core, the alternative steps is bypass using Gmail username and password after your phone locked because many time wrong answer. Find Forgot Pattern button, to bring you bypass using Gmail account. If you still can not access Google account to unlock, then you have to do hard reset with hardware button above. Hi, as far as we know, you need to make your Samsung Galaxy Core become root when need to make Beats audio running at your phone. The problem when doing root is some system files at your Android could become corrupt by application process or some wrong setting. Therefore maybe this problem also happen with your Samsung Galaxy Core. We suggest you to do hard reset or master format to make all setting back factory default or at least back to normal if you are using custom ROM. thanks a million friend, hard reset has solved my big problem so easily. Hi, I’m using galaxy core i8262. Nowadays, it is having a problem, when I’m trying to download any application from playstore it is showing ‘not enough storage’; in fact it is having enough storage in phone memory. What to do in such condition? Hi, the internal storage at your Samsung Galaxy Core is divide into 2 location, one is for system and the other one is for data. You may also have external storage if you put memory card on it. Usually the full file storage space is happen at system partitions. Although you see the free space still available, but if the size less then 200MB free space of memory storage, then the upload or install new applications from Google Play Store will stop or not success, because it need space to download, extract and install the application. The system partitions contain cache or data storage from application that sometime can not move to external storage like Whatsapp data, Facebook data, Line data, BBM data, Twitter data and something like that, in fact after use several period, that applications data will be added more and more for the history and other information. Please consider to remove some not use one to give more free storage for you internal system memory. Hi, if your Samsung Galaxy Core give the information for update firmware at notification bar, then you should finish the OTA (over the air) update process first, usually the update will fix some bugs or for major update, it will give latest version for Android operating system or firmware. If the update talk about Google Play Store applications, then you can turn it off at Google Play Store > Setting > Auto Update apps > choose Do Not auto update. The full reset code not working..what should I do? Hi, there are several options to do hard reset or full reset for Samsung Galaxy Core. If you can not access it using software menu, then you can try to do with hardware button key like #option 2 above. Please remember, doing hard reset with hardware button should start from OFF position, and press the Volume Up Button + Home Button + Power Button together until the phone vibrate, then you can release the button. Try it carefully and you can do several time (turn off again the phone) if you still can not go to recovery menu. Hi, usually when you connect the Samsung Galaxy Core to Microsoft Windows 7 computer PC, it will try to find the driver. Please connect the computer to Internet and force the computer to find the driver from Online using Device Manager at your computer. From Device Manager, try to find USB device which have yellow mark. Hi, if your Samsung Galaxy Core get trouble with the switching off by itself, there are two problem, one is software and the other one is hardware. The software usually come from applications crash, the hardware can be happen from battery or charger or the power switch. Some users get the same problem because the switch is damage or not working properly because using 3th party hardcase or softcase. However, you can try to do hard reset to make sure your applications back to factory default and the os is reinstall with clean one from the source. If this problems come from apps, then it will work normal again. Otherwise, you should consult with Samsung authorize service center. Hi, if your Samsung Galaxy core LCD screen is not always responsive, first you have to make sure to remove any screen protections, if the problem still happen then maybe some applications can make trouble with it. You can make sure by doing hard reset or reformat your Samsung Galaxy Core. If after reformat the LCD screen still not responsive, it might be some trouble with your LCD digitizer and need to be check at Samsung authorize service center. Hi, Safe Mode is usually happen when Samsung Galaxy Core applications run with some strange behavior, it will try to boot without running all non default installed applications. However, you can try to turn off your phone or batter also remove the battery and wait about 2-3 minutes, after that please try to put the battery in the right positions, and turn it on again. If the phone still can not boot normally, then you should consider to do hard reset, at Safe Mode, you can use software menu to do hard reset or master format. I tried updating software & restoring factory settings, but it’s still appearing. But no obstacle to any application. Device is fine. It is appearing on homescreen unavoidably. Consuming battery & avoiding unlocking feature. Kindly help me sorting this issue. Hi, sometime this situation also happen in some moment, but it will disappear after rebooted. We still do not have idea about the causes, maybe some other members or users can give advice. I try to hard reset my phone gt-i8262 but a warning occur what can i do? Hi, what kind of warning that appear at your Samsung Galaxy Core? Which previously I could see after download message. Hi, usually this problem happen because there are no additional free space at your internal memory. Therefore your download can not start correctly. Please note, although your external memory still have many available space, but the download progress from browser usually will automatically save files inside internal memory. Please check your internal memory capacity fron Setting > Storage. My device samsung GT-i8262 not start. When i am inserting battery ,its vibrate and showing samsung screen for few second. ann then off. Hi, please make sure your battery of Samsung Galaxy Core already charge properly. You can try to change your phone and press POWER on while charging. If you phone do not give any notification while charger connected, then you should try to use different Android charger for test your phone. If you are sure the charger is fine, then you have to do hard reset using hardware button combination key like steps at #Option 2 above. when i press for sec 2 vibrate comes up and device open normaly !! Hi, basically to hard reset or reformat your phone using hardware button combinations key with that 3 of them, but you also can try to use 2 hardware button combination Power + Volume up. Please try several time carefully. Hi I use samsung galaxy gt 18262.when I cal by skyep ryang my friends can’t hear me pls can u help me. Hi, as far as you can use your microphone, then your Skype should work normally. If you sure your microphone is fine, then you can uninstall your Skype and try to fresh install it again from Google Play Store. Hi, you have to make sure the Internet connection active when you want to recovery or unlock or bypass forgotten security screen lock at your Samsung Galaxy Core. Please make sure your GSM simcard Internet service is active, or change with other Internet ready GSM simcard if available. If you still can not access Gmail account at your Samsung Galaxy Core, then you have to force hard reset using hardware button combination key. plss help me i lost my all contacts and msg and all data on muy galaxy i8262 yesturday and not any backup of all data . so pls recover my data wht i do…. Hi, actually all contact data that is lost or deleted from your Samsung Galaxy Core can not recovery at all. But the last possibility is your phone have some synchronize data with Google server, if you have signed in with any Google account at the first time your use your phone. Please find some backup data from https://www.google.com/contacts Login with the same account with your phone. Sir bt when I press hold home screen and volume key button all thngs all right bt unfortunately on the screen there is caution like sign on the android snap and the functions are showned I opened them nothing is going on try to help…. Hi, to hard reset Samsung Galaxy core using hardware button is using steps at #Option 2 above, but this steps only can work at standard situations non root or not use custom rom. This steps also will not work if your Samsung Galaxy Core get hard bricks and need to consult with Samsung authorize service center. Hi, if your operating system or firmware has get damaged or corrupted, then you have to do hard reset or reformat to factory default. Doing hard reset using hardware button usually work without problems at standard ROM. However, you also can try to do hard reset with secret code for your Samsung Galaxy Core. I am using Samsung GT-I8262. My mobile has suddenly stop giving message notifications. I have restarted it as well. Checked its settings as well. It is neither silent nor notifications are deactivated. Please help…. I’l be really gratefull…..
Hi, have you already install some 3th party applications which can causes your Samsung Galaxy Core become trouble? Basically the notification will be appear at notification bar upside your Android at the same line with clock. If the notification bar can not show anything while you get new push notification, then maybe some crash make this trouble happen. Please consider to do hard reset with software menu. Hi i have a problem with my samsung galaxy gt 18262. Although i have wifi and the conection is just fine and it is saying connected, i can’t use any browser or playsore or gmail or viber or skype….it’s like i have not internet but it has….plz tell me what to do…!!!! Hi, first you have to make sure your phone not in airplane mode. If you are sure airplane more is off, then please try to use different wifi access point, maybe your source access point or router wifi not connected at Internet. If this is happen, you Samsung Galaxy Core still show connected to wifi, but no Internet work. My mobile after call automatically silent mode…. Hi, maybe some 3th party installed applications make your Samsung Galaxy Core become automatically silent mode after phone call. You can try to delete data and caches from Setting > Apps > All, then click Dialer, then press Clear DATA and Clear Cache button. Otherwise you should find suspected installed applications and uninstall that apps. If still not work, then please consider doing hard reset. Hi.. i’m trying to transfer the mp.4 video and wmv format from my PC to the phone. When i want to play it, it show audio data playing only. Can figure out what happen? Hi, please try to download VLC media player from Google Play Store, this is free and have many codec, so it should play your mp4 video without problems at your Samsung Galaxy Core.